Health Clubs at Home prove that you don’t need to be part of a professional gym to get professional treatment. The gym equipment experts are helping people see that the revolution starts at home with a huge range of new and used commercial Treadmills for sale. 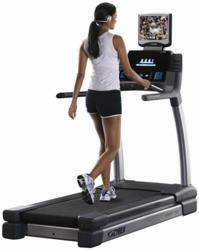 Commercial Treadmills offer many benefits over machines designed for home use. The benefits of working out at home are clear. Less self-conscious, more willing to work up a sweat and the ability to jump right in. So why not mix this with commercial equipment, such as Treadmills, as part of your home gym set up? Doing this makes the perfect stage for a successful and stress free home workout. Managing Director Howard Braband has created the platform that can make this possible. For 10 years his award winning company has offered people the chance to work out from home. This is with a range of both new and refurbished commercial fitness equipment. Everyone will have different tastes when it comes to Treadmills. It is safe to say that Health Clubs at Home can cater for all of those needs. Whether it is style or a certain function that is the most important. Howard Braband also comments; ‘We are able to offer customers some top of the range machines, such as the Precor Treadmills. All of this is done at a very affordable rate. Meaning customers will pay a fraction for the gym equipment that the commercial gyms did, sometimes only just over a year before. As well as single machines there are fantastic offers available. Such as the garage package which includes a Treadmill, Bike and Rowing Machine. All this means that fitness enthusiasts can have a mini commercial gym in the garage, for the equivalent price of one machine. That’s not to say that Health Clubs at Home are limited in their selection. There are several brands on offer to customers, all offering something a little different. In the same way why not try something new in the home? There are wide ranges of Elliptical Cross Trainers that are perfect for a smaller room and easily utilised in spare time. Health Clubs at Home are all about offering customers more than just a Treadmill. A new blog creates a platform for people to get involved, and is available to anyone looking for advice or wanting to share their fitness stories. By sharing health tips and workout plans, check it out now at http://www.healthclubsathome.blogspot.com.